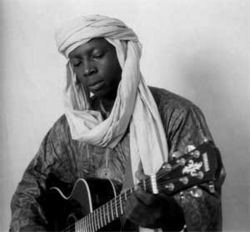 Exciting news to start off the new year as the Malian singer, songwriter and guitarist Vieux Farka Touré announces that he will be returning to the UK for a 10-date tour during February 2012. The tour starts in Glasgow (as part of the Celtic Connections festival) on 5 February and carries on round the UK (full details below). It also includes a special show at London's Queen Elizabeth Hall which also features British blues singer-songwriter Oli Brown's trio as the opening act. Other cities on the tour are Edinburgh, Leeds, Kendal, Birmingham, Bristol, Manchester, Brighton and Southampton. Emerging out of the shadow of his famous father – beloved African superstar Ali Farka Touré - Vieux Farka Touré has become one of the most celebrated African guitarists in modern history. His latest record and his third studio album, "The Secret", was produced by Soulive's Eric Krasno, and features collaborations with guitar greats, Derek Trucks (Allman Brothers Band) and jazz-guitar maestro John Scofield, as well as an inspired vocal contribution from South African-born singer Dave Matthews. Vieux Farka Touré represents a generational bridge connecting American and African blues music and culture. It's simply impossible to burden Vieux with old associations. When you hear that guitar rip over those blues progressions, when you hear the electric buzz of his rock-influenced solos, you don't stop to think what nation the man is from - you simply become engulfed in the music. Speaking of the evolutionary struggle of his country's tradition, Vieux explains: "My music is more mature now, more evolved. It digs deeper into the past and pushes harder into the future as a result. This is a hard thing to explain, but hopefully the music speaks for itself. Do you want to know the secret? You have to listen to the album." A tireless, highly energised performer, Vieux is known for captivating audiences from all over the globe with his speed and dexterity on the guitar, as well as his palpable charisma and luminous smile. His current live performances - Vieux (vocals and lead guitar) backed by Johann Berby (bass guitar) and Tim Keiper (drums and percussions) - have strong parallels to the "power trio" combined with dexterous trance-like guitar solos. Not only has Vieux broken through to contemporary audiences, but he simultaneously remains one of the finest performers of desert-blues on the planet.